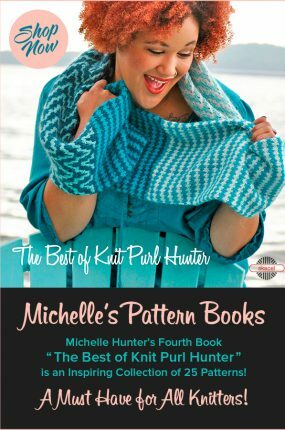 For your convenience all Knit Purl Hunter video lessons are listed below by category. Just click on any of the titles below to view that post’s video. NOTE: If you prefer to view an alphabetical list of my video lessons click here. So many good options. Search on Ravelry for sweaters knit by many people and read over their notes to be sure it is well written. Choose the finished size for how big you want the sweater to be on you. I recommend measuring a sweater you love for a guide on your best fitting measurement. I have enjoyed your Building Blocks, Building with Color and Building with Lace projects. The videos have been so very helpful. Thinking now about a first sweater. Any suggestions? Help! I am getting ready to knit a sweater and am wondering about sizing. When the pattern has a 4″ positive ease, how do I incorporate that positive ease into the size I choose to knit? The bust size is 38″ and the finished measurement is 42″ closed. So do I choose the size bust size measurement or the finished bust size measurement? I thought I already asked this question….but maybe not!! Watch my yarn over video all the way through and I do demonstrate how to execute a yo before a purl stitch. Happy knitting! I haven’t been knitting very long. I just started a block that has P1, YO, P1. I’m confused as to how to do a yarn over when the yarn is already in the front. I can’t find anything on the internet that tells/shows how to do this. Please help. The Sewn Bind Off more closely matches the Long Tail, but not everyone likes to use a tapestry needle in place of a knitting needle. Thank you for your Slip Stitch Edge video. I have never been comfortable with my work when the pattern calls to slip the first stitch and your video was a great help. My question is about something else! Is there a bind off that mirrors the long tail cast on? I normally use the basic bind off but like the way the cast on edge looks rather than the bind off edge. I don’t have one specifically for that stitch. Thanks so much for checking with me! Do you have a video for the Raspberry stitch? I don’t see one but maybe it has a different stitch name. Your videos are the very best!! Try my Slip Stitch Edge video for a lovely trim. Happy knitting! Can you make a video on how to make a clean edge. I am knitting a blanket which is a seed stitch. I know to slip the first stitch but one side always has knots on it, I am confused as to how to have both sides with a clean edge. First, I love and appreciate your books and videos. Thank you! I am knitting the blanket in Building in Color and am on the short row section. No matter what I do, I have holes when I turn my work on the short rows. What am I doing wrong? Several videos talk about wrapping, but that doesn’t seem to fit here. Thank you in advance for your help! Thanks for making me a part of your knitting! I think your video on K1B was great. You did not knit fast or talk quickly. Now I feel I can try this technique with the K2B pattern I have. I subscribed to your newsletter! Thank you for your feedback in the gauge for the dress. I think I can do that. It makes sense.m❤️ You’re so great in responding to the questions we have. There is no set formula for adjusting stitches. You would need to swatch and see how many stitches per inch and then remove that number for each number of inches you remove. You would also need to know the stitch multiples in the pattern to maintain the design. My granddaughter loves a dress and wants me to knit it for her. The trouble is the dress has a chest I’d 28″, size 8, and her chest is 23″, and a size 4(?). Is there a formula to change the number of stitches? Thank you. I have been knitting the Namesake pattern which I love. I have reached row 31 in Chart B. My question is how many RTs do I knit. All the other rows so far have had 12 stitches. This row is K4, RTn, p4. Thank you for your help. Your videos are wonderful!! I don’t have one, but thanks for the suggestion! 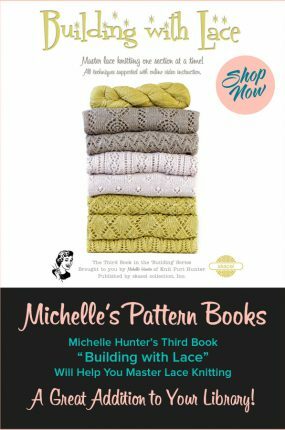 Michelle, have you done a video on knitting garter in the round? If done as knit a round, purl a round, it leaves a line or jog. Any tips to avoid the jog? I hope you like it and are having fun! I used Yarnspirations Caron Chunky Cakes and from what I could tell it was done tightly, but I’ve only been knitting for 8 months so who knows! I knotted the ends as shown in the video and weaved the trails into the pattern. Hmmmmm…Was the seam sewn firmly? What type of yarn did you use? I made a 3-panelled afghan in an Irish Moss Pattern and used the vertical seam to sew the panels together. After the afghan has been used a few times, I’m finding the panels are begining to seperate leaving me with some large holes between panels. The yarn is still intact all the way through but it didn’t hold as strong as I’d hoped. I’m assuming I did something incorrectly but I’m hoping there is a way to fix the problem for the next afghan I’m currently making the same way and to repair the one I’ve already made. Thanks for knitting Building Blocks with me! In Row 3, work all of the stitches after the asterisk (there are 21 sts), work them all again (that makes the total up to 42), then work the stitches after the asterisk again but this time stop after working the underlined p2 (these 10 stitches bring the total to 52). Be sure you are working the RT twice in each repeat. Hope this helps! I’m working the Building Blocks patterns, and really enjoying them! However, I’m having trouble with block #6, row 3 in the body. It says, “*P2, k1, RT twice, k1, p2,(k1, p1) 5 times, k1; repeat from*, ending last repeat after underlined stitch. As I count this, there are 9 too many stitches. What am I doing wrong? When doing ssk instructions that I have from a pattern from Ravelry says to knit thro the back loop. Is there a difference?? Thanks for knitting Building Blocks with me! Perhaps the problem is with how you are reading the directions. You will work the (p3, C6B) three times before the (C6F, p3) three times. So that means to p3, C6B, p3, C6B, p3, C6B, C6F, p3, C6F, p3, C6F, p3. Hope this helps! Congratulations on finishing your blanket! If you would like to have a picot edging without the border below it, pick up and knit one round and then go immediately to the bind off as described in the book. I recommend trying this out on a few inches of your edge to see if you like the results. No sense in picking up hundreds of stitches all around and then finding out you are unhappy with it. Hope this helps! I have finished your color block, seamed them together and would like to add a picot edging, not a border, as you suggested in your book. How would I do this? I will add that to the filming queue. Can you help show me how to K3 TBL? 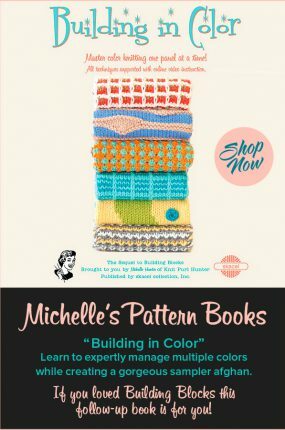 Do we still have access to your previous patterns under knit along? I can’t seem to find them? Here is a link to the pattern on Ravelry. Please let me know if you have any problems downloading it. Happy knitting! I love your video’s and use them often!!! I am trying to find the free infinity scarf pattern and I can’t download it. Would it be possible for you to email it to me? Long Tail and German Twisted. Which method of casting on do you consider to be the most stretchy? Is there a video that teaches the knitted crocodile stitch? I have a video for bobbles. So sorry that your comment was “lost” in cyberspace and I’ve now just found it! The videos are referenced in the book. You will use the Horizontal Seam video and the Vertical Seam video. Thanks for knitting with me! The German short row heel was featured in my Cableship pattern. You can find it on Ravelry. So many to choose from! Besides the basic knit and purl, I would watch the Long Tail Cast On video since it is the most universal cast on. 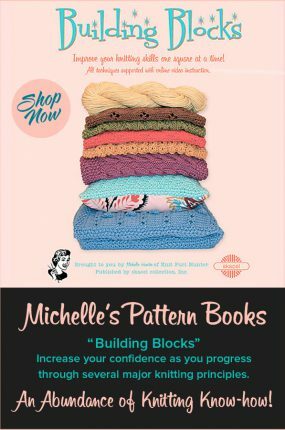 For newer knitters, I highly recommend my Building Blocks book. It is a series of 12 squares where each block focuses on a different skill. Beginning with knit and purl, the blocks are worked in a skill-building sequence where each block builds on the previously learned techniques. All of the skills are supported with my free online videos which are referenced throughout the book. The book is available at local yarn shops, from yarn online retailers and as a digital download on Ravelry. Please let me know if you need any assistance locating a source. Which of your video(s) would be best for a beginning knitter? Your videos are fantastic. Where do I find the toe up sock pattern as stated in the tutorial for german heel please? I’m almost finished with Fourteen carat, but can’t find out my instructions on how to sew it together and can’t find the clues here on your site. Am I looking in the wrong place? Thank you!!!! I made your ‘Building Blocks’ as a KAL several years ago. I had heard you had a video on how to connect all the squares. Could you tell me how I could watch that? I am looking for a tutorial video that was supposed to be online for knitting bubbles. I cannot find it on you tube or the Knit Purl Hunter site. Can you help? what a wonderful blog I can’t thank you enough for your videos they are the best have helped me so much thank you again !! Thank you for your lovely, clear videos. As a beginning knitter I am actually feeling increasingly proficient and learning new techniques and stitches quickly thanks to the safety net of having the videos to refer to. Not rocket science after all! I want to thank you for the best knitting tutorial site. I have this bookmarked for teaching me different knitting techniques. Your videos are so very helpful. I live in an area where there is not a knitting shop. Thank you for helping me learn to knit. I just want to say how very very helpful I have found your youtube presentations. Being a novice knitter, I have needed help all along the way and yours are so clear and easy to follow. I turn to them every time! Thank you for taking the time to make them so professional. I bought your Building Blocks book to make an afghan for my friends’ new baby. I can’t begin to tell you the number of times I used your videos to get me through stitches that were new to me. They were easy to understand, and I truly appreciated that you repeated the stitch a number of times in each video. Thanks for the great pattern book, and THANKS for all your help! I love this website. The videos are great!! I’m no longer terrified to try something new after watching a video of the stitch. Thanks!! I could not imagine your making your videos better. I was wrong the new format is wonderful. I recommend your videos to all the knitters that I know and/or meet. You have taught me so much I cannot thank you enough. You are the best teacher. The very best, easiest to understand Kitchener stitch instruction ! Sorry I missed your message! My 150+ videos can be directly seen from my website. On the home page, just click on the Video Lessons icon and you will find a listing of the titles. Bought Building in color and can’t find my way to the video’s? Help! Love this new list by category! Fabulous organization, easy to find what I need when I need a refresher or learn a new technique. You are AWESOME! This is the best, most well organized website available! I refer to it multiple times while working on projects, as my memory is not what it used to be. It has really helped me, as I don’t have to run into my local store for help all the time. Thank you, Michele, for you clear, concise videos! Wow!! Outstanding organizational setup. Your videos are beyond belief. Extremely easy to comprehend. I love them. Thank you!! I’m happy to have enabled a fellow knitaholic! Thank you for posting this sorted list! I have copy/pasted it into my OneNote for fast reference links! You’re wonderful! I am a spinner but needed to learn how to knit. I learned how to knit from your Building Blocks! Couldn’t have been a better experience! Now I’m a knit-a-holic! Thank you so much for sharing and showing the way!